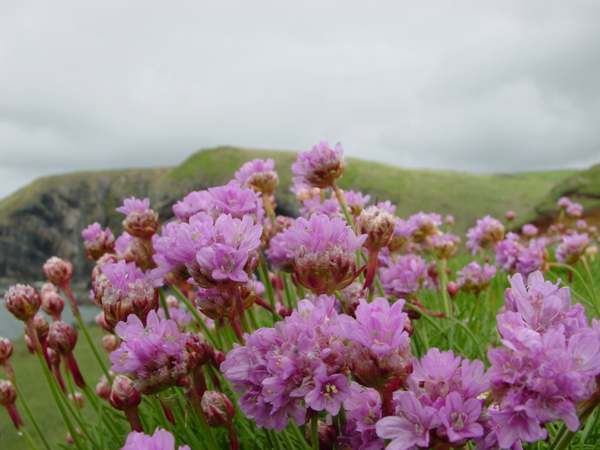 Thrift, also referred to as Sea Pinks, must be one of the most familiar of spring and early summer wildflowers to be seen on the cliff tops of Britain and Ireland, and not surprisingly it is also a very popular flower for planting in flower beds and borders in parks and gardens. Thrift forms rounded cushions up to 40cm tall, comprising pinkish flowers in compact inflorescenses above tufts of densely-packed grass-like leaves arising from a woody rootstock. The individual flowers have five pink or mauve petals, each with three darker pink veins, and five anthers that hold the creamy yellow pollen. 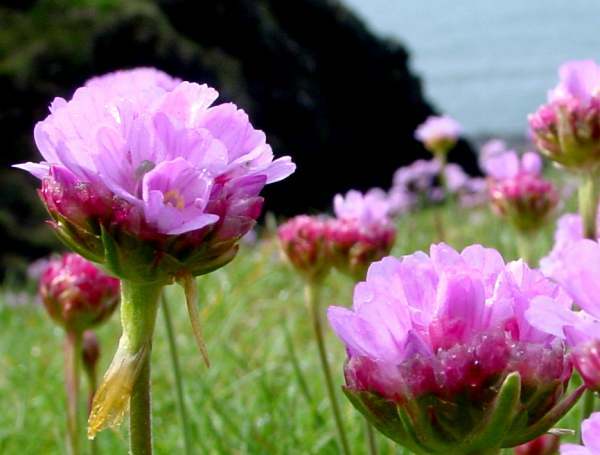 Thrift is common around the coasts of Britain and Ireland. Popular as a garden plant, cultivated varieties as garden escapes are quite common, especially near to towns and villages. Armeria maritima is also found in many temperate parts of Europe, Asia and North America. If you walk along coastal paths you will see plenty of these striking wildflowers. 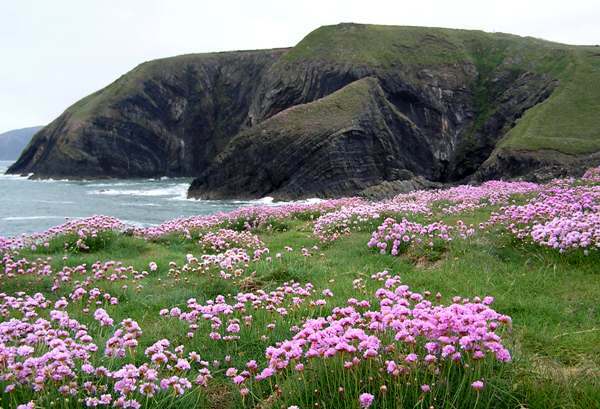 They grow on the grassy slopes and in rock crevices and on ledges, sometimes creating huge dense mats of bright pink. Thrift can grow in tremendously diverse habitats such as salt marshes and occasionally mountain slopes and exposed river gravel. 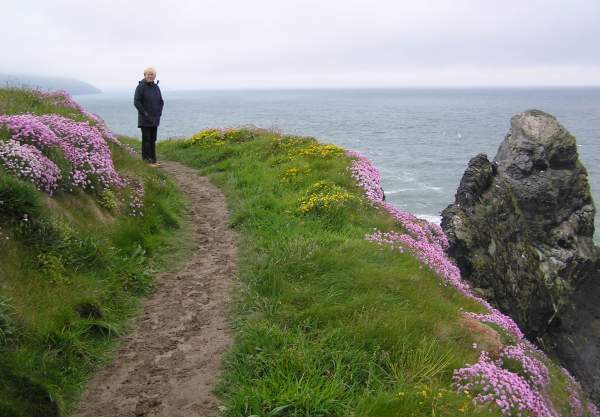 The first few flowers appear in March, and Thrift is usually at its very best in May and June. Most years a few flowers can still be found at the end of September and sometimes well in to October. Armeria is the Latin word for a Pink (Dianthus) - confusing? Well, at least the specific epithet is a lot more obvious: maritima means of the sea - appropriate for this mainly coastal wildflower. The common name Thrift probably refers to way that the leaves are closely packed together so as to conserve moisture in the salt-laden sea air. Sea Rose Armeria pungens is a taller, usually paler wildflower found in the Mediterranean region. The Thrift/Sea Pinks shown on this page were photographed near the Teifi Estuary, in Pembrokeshire, west Wales.